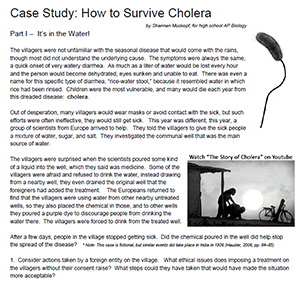 In this case, students explore how cholera is spread and how it affects the body. The case is divided into four sections, with the first part focusing on the role of clean water supplies and the spread of bacteria. In the second part, the affects of the bacteria are examined, with attention on how the cholera toxin causes cells to leak fluid. Students should be somewhat familiar with this idea from an earlier case on Cystic Fibrosis and their Investigation of Osmosis. In the third section of the activity, students look at how phages were used to control cholera. Students must label a bacteriophage and learn the difference between the lytic and lysogenic cycle. Finally, students look at how antibiotics are used to treat cholera and discuss how bacteria can become resistant to the antibiotics. Questions are found throughout the case and students are encouraged to work in small groups to gain an understanding of the topics. The final task is to write a short essay (free response) that synthesizes the main points of the case to answer the question “How can you survive cholera?” Ideally, their response should focus on prevention, treatment of the bacteria, and treatment of the infected patient. I designed the case to serve as a flipped unit on infectious disease, so it includes specific details on the anatomy of a bacteria and that of a bacteriophage to potentially replace lectures over those topics. I was originally inspired by the NSF case titled “An Infectious Cure,” which examines issues related to treating water in areas affected by cholera. This is a great follow-up case to “John Snow and the Origin of Epidemiology” where students examine how cholera was established as a water born pathogen. For fun, I keep a plush toy of a bacteriophage and a cholera bacterium to serve as visual aids. HS-LS4-3 – Apply concepts of statistics and probability to support explanations that organisms with an advantageous heritable trait tend to increase in proportion to organisms lacking this trait.